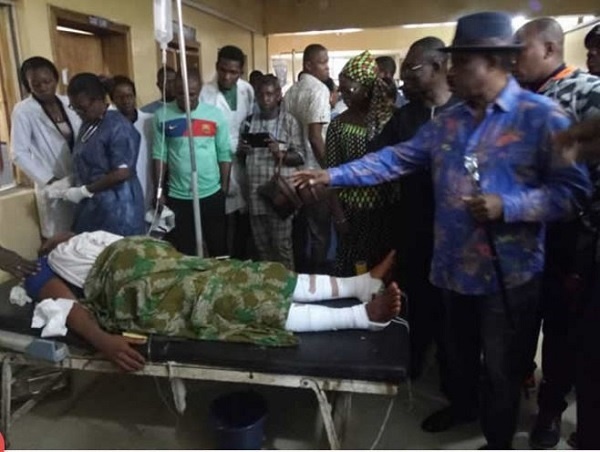 Governor Willie Obiano at the hospital. Since August 6 when daredevil gunmen stormed St Philip’s Catholic Church, Ozubulu, and killed 13 people, Nigerians have wondered if the police would ever solve the brutal crime. It appears they have made some progress. Four suspects were on Thursday arraigned before an Anambra State Magistrate Court sitting at Ozubulu, Ekwusigo Local Government Area over their alleged involvement in the killings. They were arraigned on 37-count charge bordering on conspiracy and murder. A South Africa-based businessman, Aloysius Ikegwuonu, whose father was killed in the attack, the Parish Priest of St Philip’s Catholic Church, Rev Fr Jude Onwuaso and six others were listed as witnesses. The prosecuting counsel, B.A Onwuemekaghi opposed the application, saying such plea should come by writing and not oral. The magistrate bound over the matter to High Court Nnewi for hearing on a yet to be announced date. No fewer than 13 persons were killed and another 22 wounded in the early morning mayhem on worshippers.